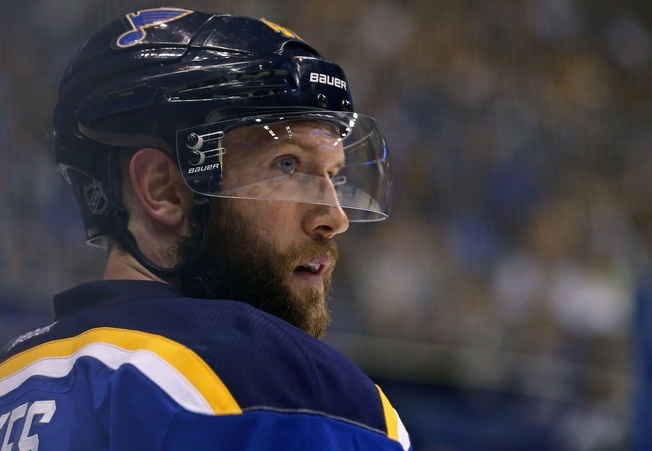 David Backes is moving on from the St. Louis Blues. The 32-year-old centre has signed a five-year contract with the Boston Bruins. The deal is worth an estimated $30 million. Backes was drafted by the Blues 62nd overall in the 2003 NHL Entry Draft. After stints in Peoria, he joined St. Louis for the 2006-2007 season and stacked up 727 career regular season games. In that span, the Minneapolis native managed 460 points – including 206 points. Backes’ best season came in 2010-2011, when he piled up 62 points in 82 games – including 31 goals. Backes is a tremendous two-way player, with a knack for playing solid shutdown hockey. He can play centre or wing and averaged over 19 minutes of ice time a game for the Blues. He averaged 18:40 in this year’s post-season and was instrumental in St. Louis’ playoff run. In some sense, it’s hard to imagine why the Blues wouldn’t want to bring Backes back for another kick at the can. They’re going after a Cup with Ken Hitchcock in what will be the coach’s last season, so one has to imagine that the veteran would’ve proven part of those plans. Right? Apparently, term was an issue. As in, Backes wanted more than what St. Louis wanted to give. Armstrong went on to explain that the analytics didn’t bear out, suggesting in short that Backes was past his “peak window.” The short version is that the Blues weren’t going to pony up green for a player they believe is past his prime. And Backes, for his part, said money was indeed also an issue. Regardless, the book is closed on a 10-year run for player and team. And that’s kind of sad.